Video by UK Agricultural Communications. LEXINGTON, Ky. (March 22, 2019) — In the more than 10 years since its inception, the UK Plaid Project continues to morph and evolve, and University of Kentucky students continue to play an integral role in it. 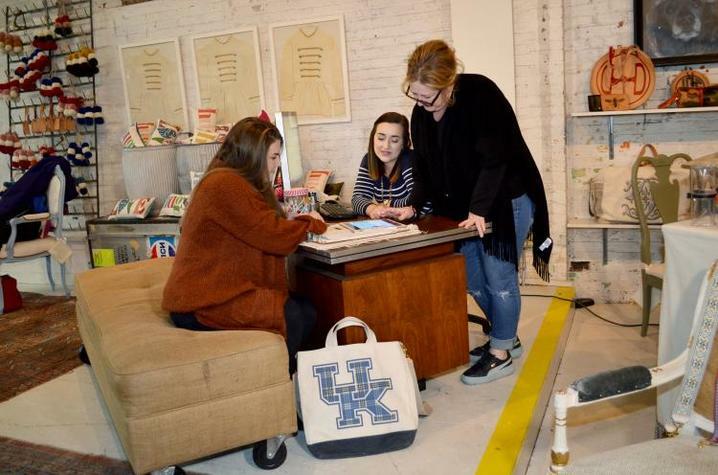 A new vendor partnership with Lexington-based Henry Dry Goods has taken the project to a new level with internships and part-time employment for UK College of Agriculture, Food and Environment students majoring in merchandising, apparel and textiles. The connection began when UK Associate Professor Scarlett Wesley’s senior-level Merchandising Strategy Analysis class worked on a semester-long project that was unrelated to the UK Plaid Project for the company. At the same time, Sherri Henry Wolf, owner of Henry Dry Goods, maker of small-batch handbags, was working with the UK Plaid Advisory Committee on developing UK Plaid products. After meeting Wolf at the company's headquarters in Lexington, several students in the class pursued internship possibilities with her. This past fall, she took on three to work on various aspects of her UK Plaid product line. Henry Dry Goods released its first UK Plaid products this winter, which gave the interns valuable experience being on the ground floor of the product launch. Megan Stevenson, a senior from Cincinnati, Ohio, was one of the interns. She hopes to one day be a buyer or stylist and eventually own her own business. For Emily Stugan, a senior from Somerset, Kentucky, her internship has morphed into a part-time position at Henry Dry Goods as its social media coordinator. She is now thinking of social media as a potential career path. The internship has given her significant experience. “I’m looking firsthand at the social media, production, branding, design, finances and logistics sides of here. How many other students get to sit down every day with the CEO and designer and talk about what she wants to do with her brand and bounce ideas off her? It’s more than I ever thought I would get to do in a college internship,” she said. For Wolf, the interns have brought fresh ideas to the business. Internships are required for all merchandising, apparel and textile students before they graduate. The internship with Henry Dry Goods was a great opportunity for students to get experience they would not typically receive locally. Both parties plan to continue the partnership. UK students Megan Stevenson (left) and Emily Stugan (center) with Henry Dry Goods owner Sherri Henry Wolf. Photo by Katie Pratt.